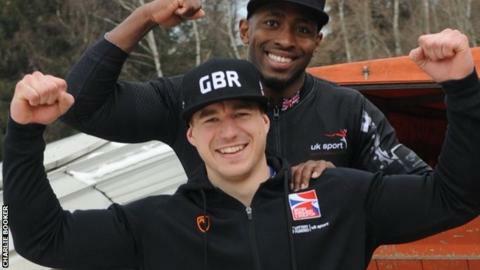 Great Britain missed out on their first medal in a men's bobsleigh World Championships for 50 years by just 0.20 seconds in Igls, Austria. Bruce Tasker and Joel Fearon finished fourth, with Germany taking gold and silver and Switzerland the bronze. It was Tasker's first major global competition as a pilot and he said: "I'm pinching myself. "The result was far, far better than I could ever have imagined and I'm absolutely over the moon." Nicola Minichiello and Gillian Cooke were the last Britons to win a World Championship medal when they claimed gold in Lake Placid in 2009. In the men's competition, Robin Dixon and Anthony Nash won three world medals between 1963 and 1966 as well as winning Winter Olympic gold in 1964. Britain's last major medal was at the 1998 Winter Games in Nagano, where the four-man team claimed a bronze medal. Tasker, who is only in his second season as a pilot and also competes as a brakeman in four-man, added: "It's amazing to know that is our best result since 1998. I've had my ups and downs this season and I'm just glad to get it right on the day." Fearon added: "It's surreal - it's better than any dream I've ever had - and we can still get better at the start so I hope there's more to come."